I wanted to make a mod similar to this one for personal use, with different values and compatible with New Flora, i.e. without modifying the spawn part. I edited the .rsc file, ran the game (from the mod kit), repeated several times until I found values I like, and everything worked fine. However, when I packaged it into a .pkm file (to use in the normal steam game), it just doesn’t work, either in the mod kit or steam version. It packaged fine, without any errors, I can enable it in the menu, but it just doesn’t do anything, trees act like vanilla. 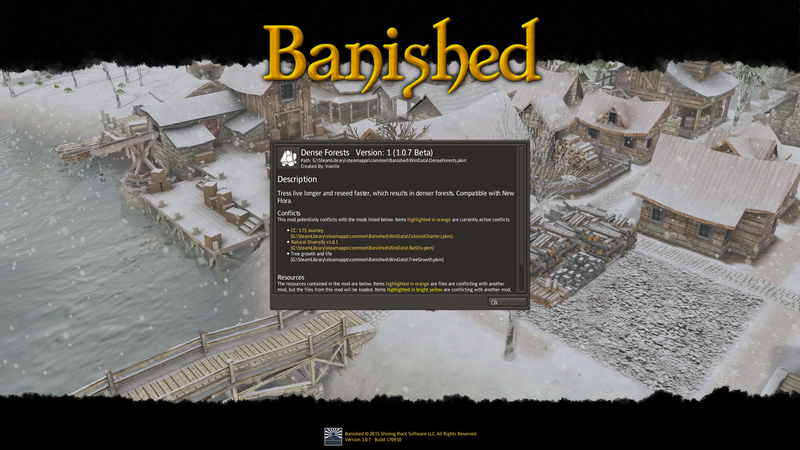 This is my very first attempt to mod Banished, so it’s possible I made a stupid newbie mistake. Here are the files. If you copy the .rsc file into templates and overwrite the original one, the mod kit game will be affected. I set the numbers to extreme so it’s really obvious when it works (if it’s active, a lot of new trees are spawned really quickly in any available areas). i've compiled your mod, took the .pkm and moved it in my game /WinData folder and seems to work perfectly, in matter of just a couple of months at 10X i've got dozens and dozens of new tree spawns. it seems to work OK. did you transfered it in your Game WinData folder and enabled it in your Mods Window before your started a new game ? If you tried to enable it in a previous saved game, keep in mind, when loading a save game and add a new mod to the save game, you need to go back again in the mod window and re-enable it for that specific save. although, maybe you need to start a totally new game. I downloaded your .pkm file, and put it in my game. Wow. I have to use Slink's Lawn, just to keep the growth in check!! I decided to share it in the download section, here Does anyone know how to add it to Steam workshop? In Cities Skylines there’s an in-game option, but I don’t see anything like that in Banished. I don’t seem to have those buttons, but I also see that in your screenshot it says version 1.0.7, while mine says beta. I assume I downloaded the wrong mod kit, where can I find one that is not beta? wait, you dont have a steam version ? And I have automatic updates enabled. 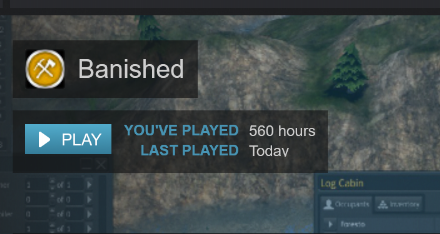 Even if I didn’t the game should be the latest, as I got it this year. However, the version number in the mod kit game says beta, so I must’ve found a wrong one when I googled it. Right, I downloaded the other mod kit version, compiled the mod again, and uploaded to the workshop (can be found here). Thanks everyone for the help I might need more help if I decide to do something more advanced (I was thinking about adding trees I made for Cities Skylines), but I’ll create another thread for it.